Geosteering is a practice specific to high-angle and horizontal (HAHZ) wellbore drilling. A good "early" historical perspective of horizontal drilling is published in Journal of Petroleum Technology, July 1999, pages 20-24, titled "Horizontal and Multilateral Wells: Increasing Production and Reducing Overall Drilling and Completion Costs"; part of a series sponsored by Society of Petroleum Engineers (SPE) Foundation. The link to its pdf now requires SPE membership or $$$. :-( On a lighter note, the American Association of Petroleum Geologists presents with candor, "Geosteering: Like Landing in Fog." Horizontal drilling in the USA became a niche practice during the 1980s and was only applied in certain fields and areas. During the 1990s the average fraction of drilled oil & gas wellbores that were horizontal at total depth ("horizontally TD'd") was 7%. 2004 was the first year the average weekly fraction was 10%. Wells horizontally TD'd first exceeded vertical+directional in March 2010. Not long thereafter the fraction hit 60% in May 2012 and 70% in October 2014. Finally, 80% was first tagged in February 2016. As-of April 2019, the fraction of wellbores horizontally TD'd is ~87%, according to Baker Hughes Rig Count data. Geosteering in general is drilling a horizontal wellbore that ideally is located within or near preferred layers of rock. As interpretive analysis performed while drilling or after drilling, geosteering determines and communicates a wellbore's stratigraphic depth location in part by estimating local geometric bedding structure. Early geosteering was performed mostly as inference from cuttings samples, paper well logs, structure maps, rough sketches, and 2D trigonometry. Modern geosteering normally incorporates more sources of information and insight from now-evolved quantitative correlation methods. Ultimately, today's geosteering provides explicit approximation to the location of nearby geologic beds in relation to a wellbore or coordinate system, and as such, helps to explain rock/wellbore completion and subsequent oil/gas/water/frac fluid-flow observations from or into rock. Quantitative geosteering analyses often follow one of two fundamental technical approaches. Along the horizontal wellbore path, one approach effectively assumes the vertical formation-evaluation (FE) well log profile is known while the other approach effectively assumes that the stratigraphic FE well log profile is known. 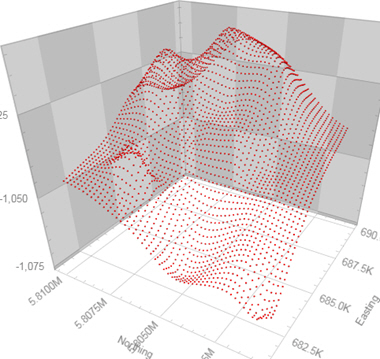 Regardless of approach, normally one or very few sparsely-distributed control well logs from non-horizontal wellbores exist in the direct drilling vicinity, and, the absolute 3D coordinate locations of control information are blurred within ellipsoids of uncertainty from directional survey "errors". In many commercial oil and gas horizontal well geologic settings, stratigraphic thickness is relatively more stable than vertical thickness along the horizontal wellbore path because bedding dip changes and faults are crossed. By definition, bed vertical thickness depends on dip (initially unknown) AND stratigraphic thickness at the map location of interest, and furthermore is complicated when considering attributes of true dip versus apparent dip and the fact that—incidentally and/or purposely—real 3D wellbore paths always turn left or turn right in map view. In numerous structurally-complex (i.e., dip-varying) geologic settings over typical horizontal wellbore lengths, stratigraphic thickness may actually be effectively constant or its thickening/thinning tendencies known with sufficient certainty. In the cross-section below the wellbore turns right about 40 degrees azimuth after landing and true stratigraphic thickness (TST) throughout is fully constant for all layers while true vertical thickness (TVT) is of course dip-dependent and thus varies. In other words, TVT will almost always vary because dip almost always varies; but the same is not necessarily true for TST. For these technical reasons and in general when trying to approximate structure/dip, analyzing FE data at the local horizontal well level in the stratigraphic depth domain is superior than in the vertical depth domain (DVerticalDepth ≠ DStratigraphicDepth) and performing 3D-math geosteering logic is superior than projecting into a 2D vertical plane (DMeasuredDepth ≠ DVerticalSection). Primary geosteering interpretation value deriving explicitly from azimuthal LWD signal is evidenced when high-side and low-side average value readings are sufficiently different while the wellbore is approaching/crossing a bed boundary with suitable signal contrast between the adjacent beds. From observing this very progression AND with certainty of immediately-prior wellbore stratigraphic location, it may for example be determinable that a wellbore is scraping/leaving a zone via its top or its base. Imaging is not required to extract this interpretation value from the data but imaging may be visually preferred and is efficient at presenting such LWD signal when available. Bed dip estimation directly from azimuthal imaging relies on multiple hole/tool assumptions and thereby introduces parameters needing tuning and/or conjecture. At least two such parameters are actual hole size at MD (e.g., from a caliper log) and "electrical penetration depth" at MD, which are unknown with sufficient accuracy to be independently illuminating. In general with all else equal, adding more degrees of freedom that require tuning ≠ less bed dip uncertainty. In other words, if quantitative dip estimation from azimuthal imaging is able to provide interpretation assistance, the stratigraphic picture is already clear from applying the fundamental correlation logic described above. Circular results aren't breakthroughs. However, to be clear, azimuthal LWD signal can at times/depths reduce uncertainty and be "leaned-on" to make smarter steering bets regarding probable geologic structural realities. 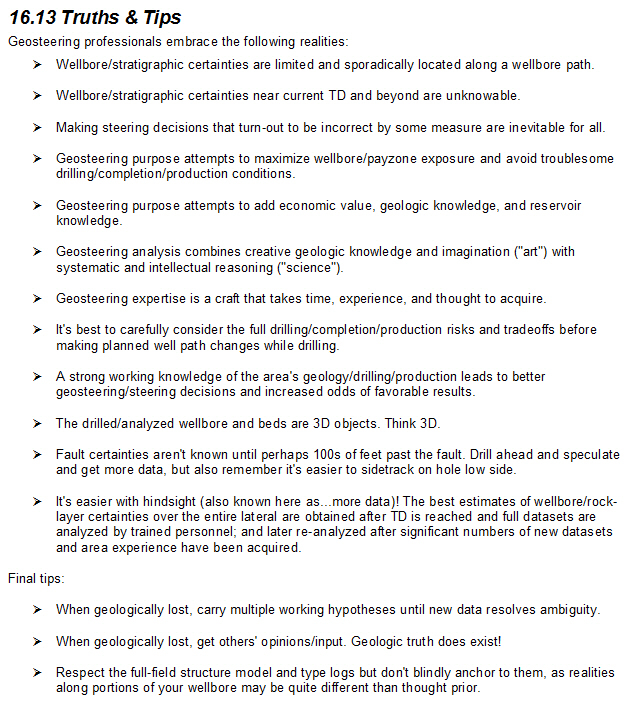 LWD tool-dependent "model-based geosteering" as a practical/non-academic geologic interpretation benefit is highly debatable. Too much of what the analyst can't know with certainty—or indeed is intended to be discerned—must be assumed, creating a major circular result. Non-uniqueness and non-practical complexity abounds and much regarding extremely pertinent parameter values such as true stratigraphic thicknesses, bed dip, and petrophysical properties at MD and at different radii of investigation, unfortunately, are unknown with insight-producing certainty. Geologic structure models have value and purpose but if they were dependably 3D-accurate at horizontal wellbore stratigraphic drilling scale—somewhere between core and vertical-wellbore—you wouldn't be reading this page and there wouldn't be >20 geosteering software offerings. Drillers would very much rather "just" drill geometry and can do so well, but operators know the less-expensive "geo-blindfolded" approach does not maximize the economic value of fluid flows from horizontal wellbores. Small-scale rock/wellbore understandings matter and the relevant $64000 questions cannot be answered or accurately predicted from large-scale models alone. 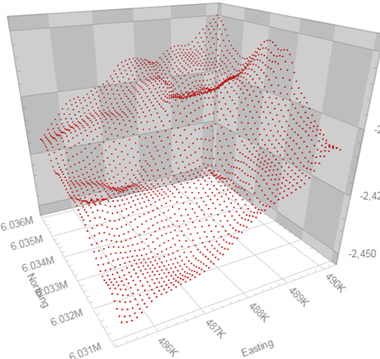 3D structure models often look neat as pixels on screens but the typical extreme sparseness of hard data samples means its structural uncertainty is beyond that which is required for commercially successful geosteering. Nature is less-often smooth and predictable and so decisions based on actual "in the rough" observations prevail over model predictions. In practice and excluding a simple local TVD bulk-shift or having external controls points located very closely nearby the subject HAHZ wellbore, adding structural control points located from behind the drill bit and re-gridding the full-field 3D structure model does not materially improve the level of certainty regarding drillable structure directly ahead of the drill bit. In uncommon data-rich situations and in particular geologic settings, grid data may efficiently communicate predicted zone thinning/thickening tendencies and major structural attributes but because small-scale dip is also unknown, significant uncertainty surrounds bed thickness insight able to be gleaned from analyzing horizontal wellbore data. Please see "Geosteering Trade Secrets" chapter in SES User Manual for much more discussion. To be clear, full-field 3D models can at times/depths generally constrain structural estimates and provide rational fall-back options when "current" data analysis situations are ambiguous. However, a real risk of materially using 3D models when geosteering is over-relying on preconceived expectations instead of best-analyzing the actual data as they are. For any and all geosteering interpretation approaches, what's precisely known is limited and sporadically located along the wellbore path. Last but not least, there certainly is no substitute for geologic and engineering intelligence—of the area and of the beds being drilled—on the ultimate ability to approximate reality sufficiently well to make informed geosteering and directional steering decisions. The following image snip is from SES User Manual, page 219. If you're new to geosteering, you may find these clarifications illuminating. The following article written by Dr. Mike Stoner was published in E&P Magazine, November 2007, pages 71-77, titled "Technical Geosteering Finds the Sweet Spot". Click here to view it with larger figures. U.S. horizontal drilling activity is booming. From five years ago, industry estimates show a five-fold increase to about 400 rigs per day. These increased market pressures have stimulated refined horizontal well data processing techniques that reveal a world of small-scale geologic features, like faulting, zone undulation, and transient dip-direction reversal. The economic results are increased production rates from more footage drilled in the reservoir “sweet spot” and—in some cases—cost savings from elimination of pilot holes. Geosteering—the task of estimating well path position within the stratigraphic setting and occasionally changing the remaining planned path accordingly—has traditionally for smaller companies been a niche practice often handled entirely onsite. However, more offsite oversight is becoming the norm because 1) accelerated production of reserves increasingly relies on correct stratigraphic placement of the lateral; 2) the logistics of onsite-to-office data transfer are simple with modern communications; and 3) technical geosteering software is available that when correctly applied enables a quantum leap of interpretation confidence compared to legacy geosteering methods that rely only on drafting tools. Technical geosteering is a computational signal-mapping task. Timely and depth-accurate logging while drilling formation evaluation (LWDFE) data is transformed—using a geometric location estimate of a marker bed—to plot on a representative stratigraphic type log. An acceptable “fit” suggests a good estimate of the marker bed location. The most common LWDFE measurement applied to technical geosteering is omni-directional gamma ray. Gamma ray is chosen because of its relatively insensitive signal response to varying pore fluids, rock porosity, rock permeability, and circumferential borehole quality. Another favorable gamma ray attribute is a short depth of investigation (e.g., 4-6 inches); with less rock “seen” by the tool there is less chance for signal complication. In oil and gas geosteering applications the measured depth (MD) frequency of gamma ray data is typically 0.5 or 1 ft, which enables fault-crossing recognition. Some operations rely on focused gamma ray measurements (e.g., borehole high side and low side readings) to either outright drive technical geosteering or to augment interpretations relying primarily on omni-directional gamma ray measurements. What complicates the software engine of technical geosteering is addressing the fact that both the well path (known-location) and the payzone (unknown-location) simultaneously change and curve in three-dimensional (3D) space. A two-dimensional (2D) technical geosteering analysis—one based on vertical section for example—inherently suppresses resolution and introduces distortion, especially with ‘3D’ wells and or ‘2D’ wells with thin payzones. In 2006, Stoner Engineering LLC developed a 3D technical geosteering methodology that eliminates the shortcomings of 2D analysis. Two new geologic terms resulted from this work: 3DStratBlock and relative stratigraphic depth. A 3DStratBlock (3DSB) is a planar surface that mathematically represents the 3D location of a geologic marker—usually the top of the payzone. The target well path is at some offset distance parallel to this marker. A 3DSB is defined with a true dip, a true dip direction azimuth, map coordinates corresponding to a MD along the actual well path, and a control point true vertical depth (TVD). Relative stratigraphic depth (RSD) is simply a stratigraphic distance relative to an “arbitrary” reference point (i.e., the marker). With respect to gamma and MD data from a logged vertical offset well or pilot hole, with horizontal beds, stratigraphic depth can simply be MD. With respect to gamma and directional survey TVD data from a directional offset well or pilot hole, with horizontal beds, stratigraphic depth can be TVD. If the beds are not horizontal then TVD should be corrected with regional dip to produce gamma versus stratigraphic depth data. Stratigraphic depth and gamma data, along with a reference depth designation, produce a RSD type log. With respect to a 3DSB however, RSD is calculated and is the minimum 3D distance from a respective coordinate—at a MD along the wellbore from where gamma data was recorded—to the plane that is the top of the 3DSB. The parameters that define the 3DSB are calibrated to produce an acceptable mapping of gamma data on to the type log. When deviation becomes unacceptable, a new 3DSB is started because in most cases the payzone has curved and or faulted. The most common 3DSB parameters to calibrate are the true dip and the MD range over which the respective 3DSB applies. After initial setup, control point TVD only needs adjustment when a fault is interpreted since continuity from the prior 3DSB otherwise makes sense. True dip direction azimuth is calibrated on the landing to produce maximum signal expansion (“stretch”) or maximum signal compression (“squeeze”), and thereafter remains constant until a transient dip-direction reversal is evidenced.‡ When a transient dip-direction reversal is evidenced, which almost always occurs multiple times along a horizontal well, the true dip direction azimuth is simply “flipped” 180 degrees. Thus, a 3DSB is a 3D planar location estimate of the beds being drilled. As long as the actual geologic structure is planar, the gamma data will map—as calibrated via the 3DSB—on to the type log with minimal/acceptable deviation and therefore produces a good estimate of well path position within the stratigraphic setting, even though the wellbore always is curving in a varied fashion. The 3DSB/RSD concept produces a spatially dynamic coordinate system inherent to the stratigraphic target. If the type log “shape” is very persistent and if regional true dips are low, often there is no need to drill a pilot hole preceding the main lateral because during the landing, technical geosteering produces constant feedback about how far the target is relative to the actual wellbore. See Figure 1. Some horizontal drilling operations design and execute the landing to penetrate through most or all of the payzone in order to confirm the gamma signature and acquire such signal magnitude respective to the specific gamma tool in the bottom hole assembly. This methodology goes hand-in-hand with a landing-derived type log. A target zone for application of technical geosteering evidences a formation evaluation signal whose functional form persists aerially and features sufficient magnitude contrast from nearby beds. 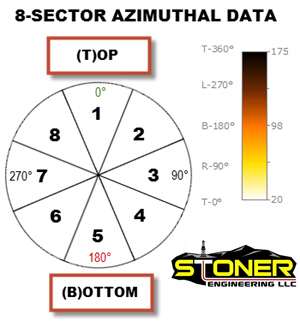 This “type log” is essential for landing the horizontal well in the payzone. Technical geosteering software called SES—developed by the author—allows for derived type logs to be created from the landing. This allows for gamma functional form and magnitude to play a role in calibrating future 3DSBs. A landing-derived type log is used to geosteer the rest of the well. See Figure 2. By observing a cross-section of TVD versus MD that displays the entire well path and the payzone as defined from the 3DSBs, the best “big picture” can be seen and drill-up/hold-steady/drill-down planned well path revisions can intelligently be made. See Figure 3. In practice, the number of target changes communicated to the directional driller can range from few to dozens. Updating the target entails specifying inclination and TVD at vertical section of zero. Post-drilling application of technical geosteering provides value by training personnel on how to geosteer/interpret, and it produces a most-complete understanding of the geologic structure and actual well path / reservoir completion. Such “in/out” understanding is often critical for example for reservoir simulation of wells drilled horizontally. It can also affect completion procedures that use fracture stimulation. The best possible geologic interpretation can be attained after drilling because there are no data depth-lag issues or general human fatigue conditions that inherently accompany live operations. Technical geosteering is a numerical tool that augments other data sources—akin to another “dimension”—to assist the operator to interpret where the wellbore is stratigraphically located. Other data that may help with geosteering may include multiple fluid-return-line-derived measures, such as sample drill cuttings analysis, gas chromatograph measurements, oil shows, gas flare height and casing pressure in underbalanced drilling operations, and general rate of penetration characteristics. Most fluid-derived measures suffer from bottoms-up lag-time issues and relatively significant source-depth uncertainty compared to LWDFE data. Technical geosteering defines locally and helps to refine globally the geologic model of the marker bed along and nearby the actual drilled wellbore. Small-scale geologic features—often ignored with legacy geosteering methods that rely only on plain drafting tools—like faulting and zone undulation become better communicated via the TVD versus MD cross-section displaying calibrated 3DSBs and may help explain subsequent production behaviors related to hydrocarbon and or water flows, and issues related to water sumps in wellbore low-spots. ‡This sentence is better as: "True dip direction azimuth is typically set from knowledge gleaned from a contour map over the drilling area, and thereafter remains constant until a transient dip-direction reversal is evidenced." The preceding article written by Dr. Mike Stoner was published in E&P Magazine, November 2007, pages 71-77, titled "Technical Geosteering Finds the Sweet Spot". Click here to view it with larger figures.